What You Need To Know Before Playing Kingdom Hearts III – I'd Rather Be Geeking! While the Dandelions are successful in carrying out their task, the fate of the union leaders are unknown. After all that chaos, five new union leaders were chosen and they decided to wipe the memory of the rest of the Dandelions so they would not remember the tragedy of the Keyblade War. It is here that we find that one of the new union leaders a murdered. I had thought that maybe Lauriam, one of the union leaders, had done it, because it seemed he was never asked to lead in the first place. But it was revealed that the murdered leader was actually Lauriam’s little sister and he’s looking for her. Will the truth be revealed in Kingdom Hearts III? Ever heard of the x-Blade? It’s the original Keyblade, but spelled with an x instead. Well, Xehanort wants this blade so that he can access Kingdom Hearts. As to why he wants to do this, I’m confused. If any of ya’ll know why let me know in the comments! But the way I see it, I think he might be trying to access Kingdom Hearts so that he can create a new world of darkness…maybe…I don’t know! Back to the story, in order to create the x-Blade, he will need thirteen vessels of darkness and seven vessels of light (this is because back in the Keyblade War, the x-Blade was divided into twenty pieces, seven of light and thirteen of darkness). But how was he to find thirteen vessels of darkness? Well, why doesn’t he just make some! 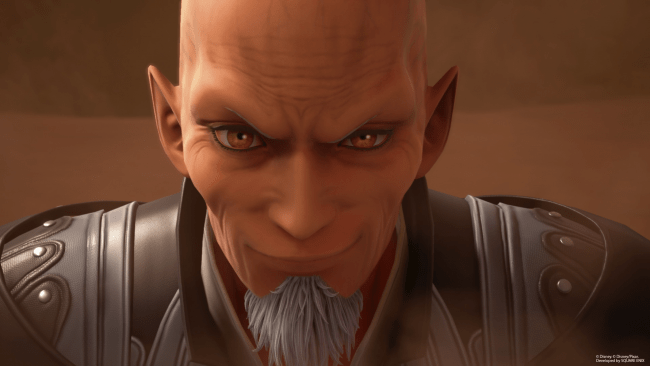 As if he wasn’t creepy enough as it is, Xehanort is actually of the search for thirteen vessels to put a fragment of his heart into. That’s why he was training Ventus; so he could use the poor, sweet, adorable child as a vessel of darkness. I will talk about why he wasn’t chosen soon. When Xehanort saw that there was a great deal of darkness within Terra, he deemed him a good vessel and began manipulating him to unleash his dark power. Of course, worse comes to worse, Terra kills Eraqus because he was trying to hurt Ven (I’ll get to that in a minute too), and a battle takes place at the Keyblade Graveyard where Xehanort takes over Terra’s heart, transforming him into one of the thirteen vessels of darkness. As I said before, Xehanort was training Ventus so he could use him as a vessel. Much to his disappointment, Ventus was actually too weak for this. Xehanort removed all of Ven’s darkness, creating the faceless Vanitas. Without darkness, Ven was getting weaker, so Xehanort took the boy to Destiny Islands (Xehanort’s homeworld) and left him there to die. What he didn’t know is that there was a very special baby that had just recently been born, and this baby’s heart grew attached to Ventus’ heart and repaired it. That baby was Sora, by the way. When this happened, The faceless Vanitas grew a face. That’s why the guy looks like Sora; because Sora’s heart was attached to Ven’s, which was attached to Vanitas. Okay, this is going to start getting confusing! 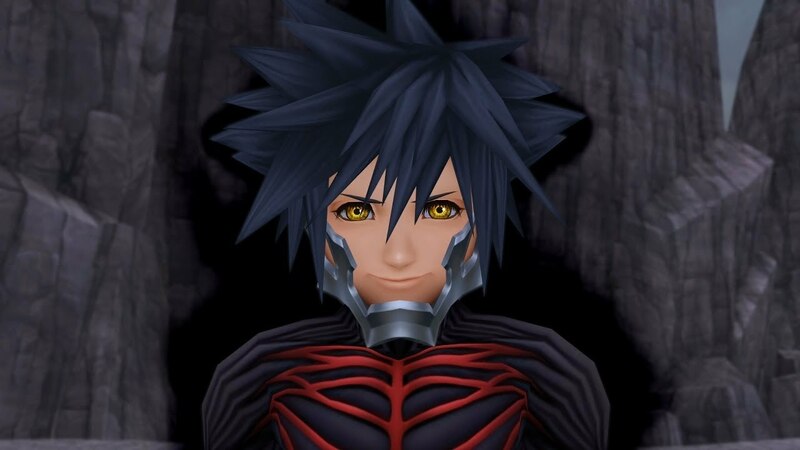 Anyway, now Xehanort is going to use Vanitas as a vessel alongside Terra. A while later, Ventus meets Aqua and Terra and begin training with them. After Terra becomes Terra-nort and Ventus fights Vanitas (momentarily creating the x-Blade and creating Kingdom Hearts), Ventus loses his heart and falls into a deep sleep. Aqua takes him to their home, The Land of Departure, and locks it away, creating Castle Oblivion. She leaves Ventus there and promises to come back and wake him up. We all know what happens to promises in a Square Enix game, don’t we? Of course, Aqua gets trapped in the Realm of Darkness. 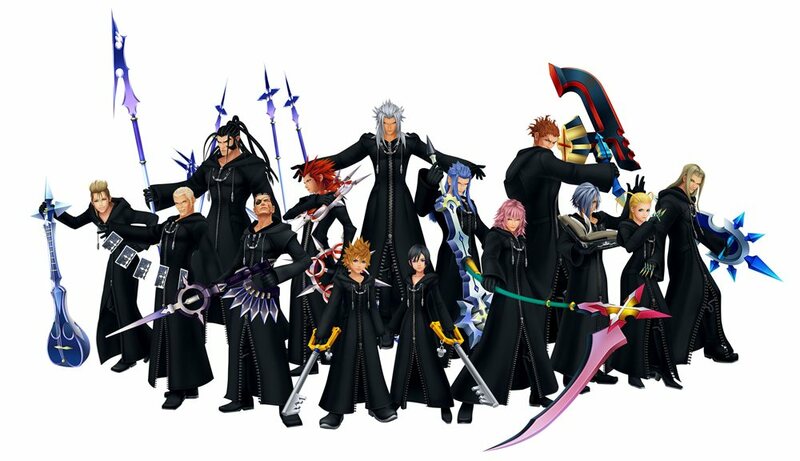 Little do they know, Xemnas is tricking them so that he can turn them all into vessels of darkness. Again, his plan didn’t work out to well because they all began to get independent and grow hearts of their own. Near the end of the very first Kingdom Hearts, Sora finally finds Kairi only to discover that she is in a deep sleep because her heart is missing. At the same time, he finds the keyhole to lock all of the darkness away, but cannot lock it because he needs seven hearts of pure light. Kairi is one of them, but her heart is missing. Riku, who is being possessed by Xehanort’s heartless (Ansem…a different Ansem than Ansem the Wise), informs Sora that Kairi’s heart is currently inside of HIS heart. Sora, being the selfless child that he is, uses Riku’s keyblade to unlock his heart to return Kairi’s heart. This causes Sora to turn into a Heartless and a Nobody, which is Roxas. But since Kairi’s heart is inside his too, Kairi now has a Heartless and a Nobody. Her Nobody is Namine, but I will discuss her next. 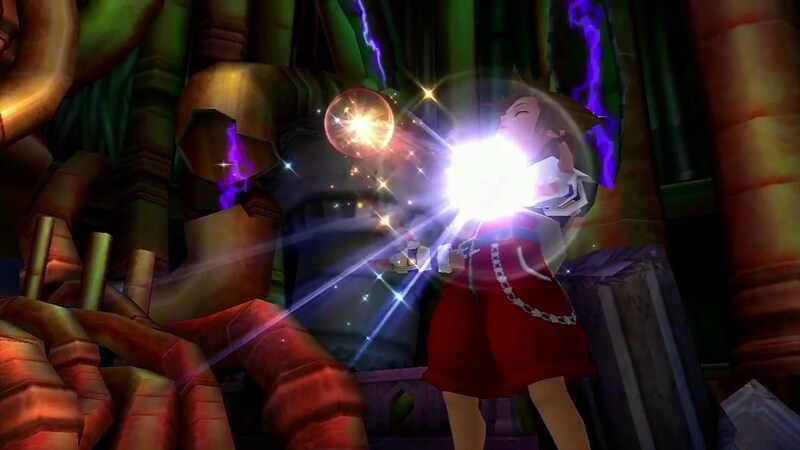 Because Kairi has the power of light, she is able to turn Sora back into his normal form. This story gave me all sorts of sad feelings. In 358/2 Days, we see the story of Roxas and Axel. The two Nobodies become close friends and always go to the Twilight Town clock tower after their work is done to hang out and eat sea salt ice cream. 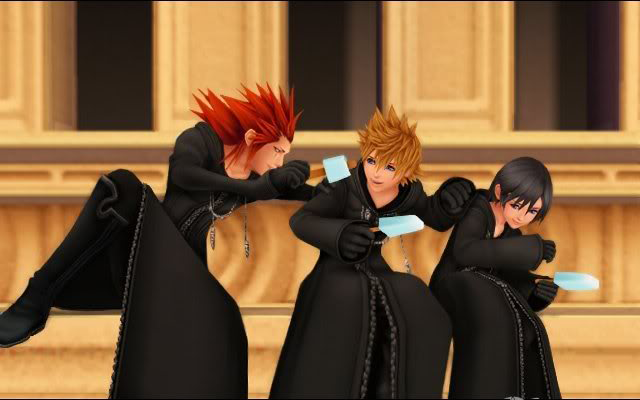 A little while after Roxas joined the organization, a new member came. Her name was Xion. She soon became good friends with Axel and Roxas and began hanging out with them too. But something strange was going on. They began getting memories of things they never did and places they’ve never been. In the end, we find out that Xion is not actually a Nobody; she’s a replica of Roxas and is feeding off of Sora’s memories. Roxas and Axel are pretty upset by this. In what has to be one of the worst cutscenes Kingdom Hearts has ever had is when Xion forces Roxas to fight her, and then she ends up dying. Roxas leaves the organization, fights Riku – and loses – and then we get into the events of Kingdom Hearts II. 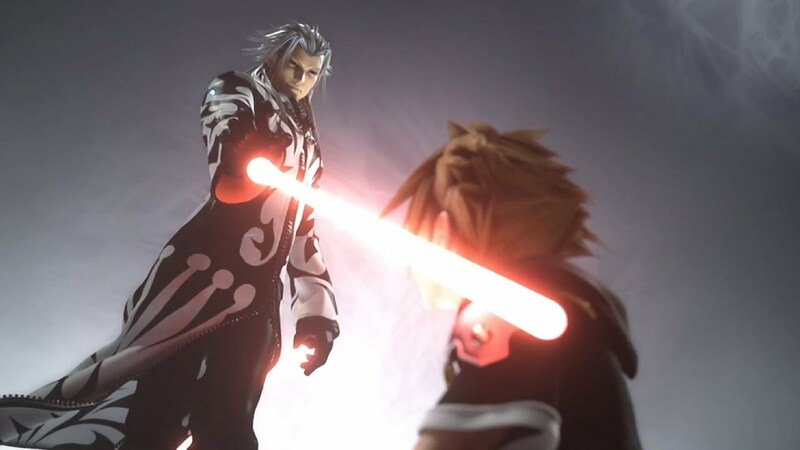 After Sora’s second journey of locking keyholes, he finally comes face to face with Xemnas, the leader of Organization XIII and Xehanort’s Nobody. 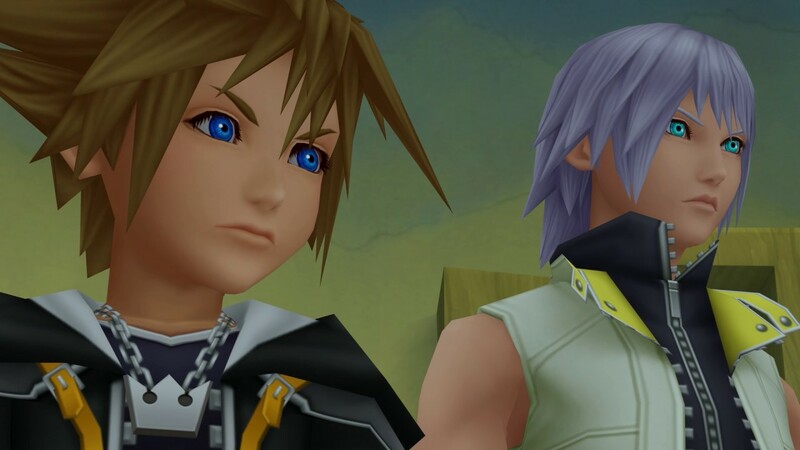 He’s got Riku to help him fight, however, and this is a battle to never forget. This fight isn’t really TERRIBLY hard, but it kinda hurt my hands. You see, at the very end of the battle, he unleashes his greatest and most powerful attack. Survive this, and the game is won with a little cutscene. Just turn the remote sideways and press the X and triangle button over and over again without stopping until he’s done. After that, Riku and Sora get trapped in the Realm of Darkness, but Sora is alright staying there as long as Riku’s there with him. The ending cutscenes of Kingdom Hearts II are some of my favorites, and seeing the door to light open and allow them to go back to Destiny Islands was wonderful. I love a good reunion! To add more confusion to the plot, we find that there was a strange addition to Jiminy’s journal. After the events of Kingdom Hearts: Coded, Master Yen Sid inform Riku and Sora that it’s time for them to take the Mark of Mastery. They go back in time into the dream versions of all the worlds to lock seven keyholes. They do so, but along the way they run into these weirdos called the Dream Eaters. There’s good ones, and then there’s bad ones, but they’re all oddly…rainbow…weird… Okay, so as the test goes on, Mickey and Yen Sid realize that Xehanort is up to no good once again, and Mickey receives a letter from Maleficent claiming that she has captured Minnie Mouse. Without thinking twice (pun intended…if you get what I mean), Mickey goes with Donald and Goofy to save her. Mickey manages to save Minnie, thanks to Lea (who is Axel), of course. (And here we learn that Maleficent is looking for that Book of Prophesies). Back in the dream world, it is revealed to Riku that he has actually dived into Sora’s dreams and has the powers of the Dream Eaters. He goes to see Sora, because he’s trapped in his own nightmare, getting deeper and deeper into darkness. Sora is going through the dream meeting people like Roxas, Ventus, Terra, all those guys, and feeling all of their sorrow and pain. This proves to be to much for Sora’s heart to handle and he succumbs to the darkness, becoming a candidate for one of Xehanort’s vessels. Right before Xehanort puts a fragment of his heart into Sora, Lea jumps in to save the day, and they all get back to Yen Sid’s tower to safety… Until they realize that Sora is still stuck in a sleep-like state, trapped in his nightmares. Riku goes back into his dreams to save him. He’s able to do this successfully, and Ansem the Wise reveals that he put all of his data in Sora’s heart in case they ever need it. Help yourself, I guess… Riku returns to the real world, where Sora is awake and happily having a tea party with the others. In the end, the only one to pass the Mark of Mystery and become a keyblade master is Riku, because he is able to keep his darkness in check. While Sora and Riku are taking the Mark of Mastery exam, down in Radiant Garden the Nobdies have returned to their human forms. Well…most of them have, anyway. Lea (Axel), Ienzo (Zexion), and Aeleus (Lexeaus) wake up to find themselves human again. Even (Vexen) and Dilan (Xaldin) are back to normal to, but were apparently resting. Lea goes to look for Isa (Saix) and Braig (Xigbar), not knowing that they have been taken as two of the thirteen vessels of darkness. Alright, I think that’s everything! If you have any questions, feel free to ask in the comments and I’ll answer to the best of my knowledge. Or if I missed anything important or explained something wrong, you can point that out too! Are you excited for Kingdom Hearts III? Let me know what you want to see happen in the comments below! God bless, and may your heart be your guiding key. Kingdom Hearts III will release on January 25, in Japan, and then release on the 29, for the rest of the world. You and me both, Water Your Plance!